Perhaps some of the best stories of the WilhelmGustloff are told through the photographs taken on board during her voyages. As with all passenger liners, photos from the very beginning of their careers and from the very end are always the most sought due to their roles in history. 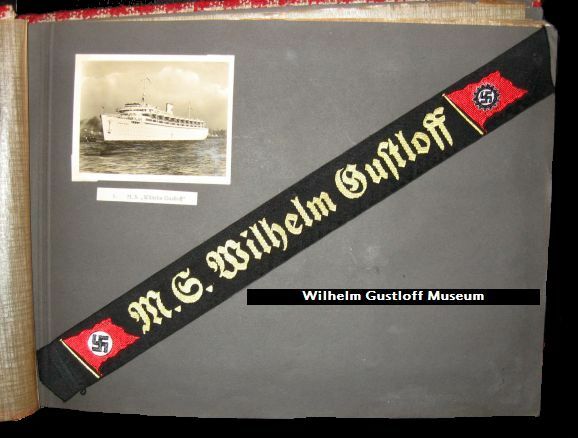 The Wilhelm Gustloff is no different. Each of these albums cover her travels from her 2nd voyage up to her 50th. On these four pages, you will find hundreds of photos from the Gustloff's voyages with thumbnail images of passengers enjoying themselves to the various cities she visited. 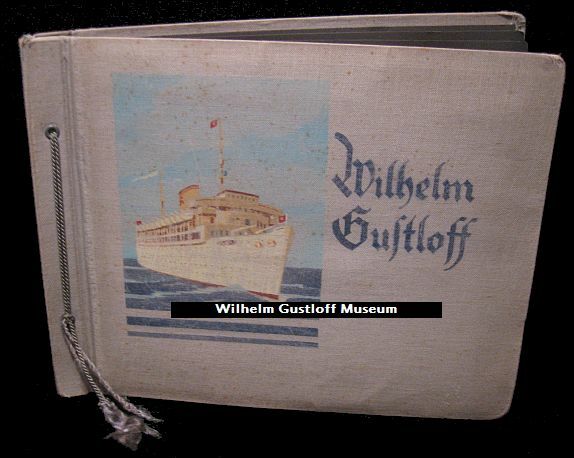 Our current Wilhelm Gustloff collection consists of 40 photo albums and roughly 3,300 images! 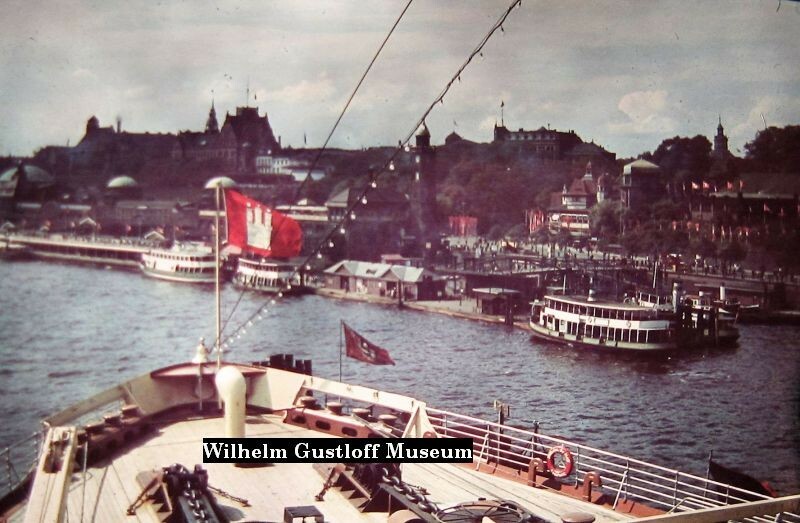 The first grouping of photos are color slides of the Wilhelm Gustloff in 1938 and 1939. My original goal was to showcase these albums in chronological order, but with this section spreading over four pages, I decided to add them as they are acquired. In the beginning, there are 35 souvenir photos of the Gustloff and the Norwegian Fjords. It is a wonderful visual documentary of one girl and her friends on board the liner for a trip to the fjords. Nicknamed the 'red album' due to its bright cover, there are great detail shots of her decks and the passengers enjoying themselves at sea. Although the mützenband is cut at both ends to fit the album, it compliments one of the 3 variations shown under the souvenir section. Most of the photos shown below will be page views when it concerns souvenirs or land excursion photos. Photos taken on board the Gustloff will be single and up close. Voyage #17: September 18th, 1938 to September 23rd, 1938. The first of several souvenir albums, begins with a luggage tag for September 18th - 23rd, 1938 with the name Hertha Lubche. 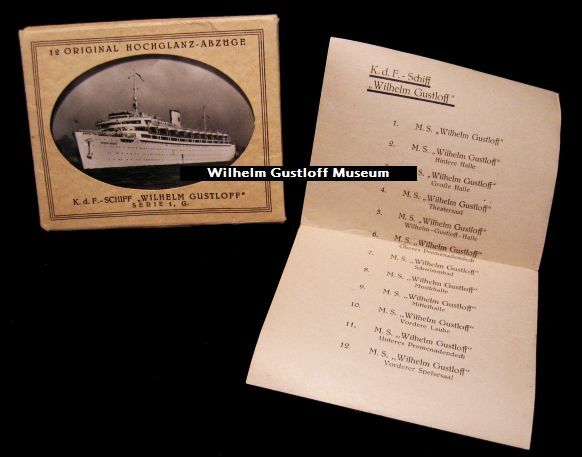 Opposite page is a large photo of the Wilhelm Gustloff and two photos. The first is R. Finke, the second is Heinrich Bertram. The majority of the next photos are views of the Norwegian Fjords from the Gustloff's decks, then several photos of the ship returning to Hamburg. This is the best condition souvenir album in the collection, looking as if it was just purchased on board. The only down side is that while its previous owner went to Genoa, Naples, and Venice on board the Gustloff, there are few photos taken on the ship. The majority of photos are all souvenir, while others for the voyage are mainly of the visits to the cities. There are two pages which feature cruisers of the Italian Navy, which were taken from the liner. Headings under various pages include: Durch Südtird, Mailand, Der Dom, Nach Genua, Campo, Santo, Nervi, Rapallo, Fahrt von Genua, O mia bella Napoli, & italienische Kreuzer. 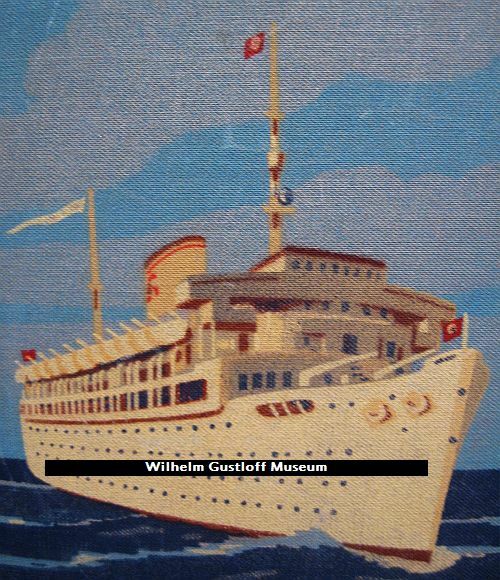 Color slides of the Wilhelm Gustloff! The first five photos below are beautiful glass & tin slides showing Hamburg & Kiel, Germany in color in 1939. My main reason for purchasing these, of course, was the color image of the Wilhelm Gustloff at berth. I have since sold the other four but wanted to show them as well. Other ships include vessels of the Kriegsmarine, a few unknown passenger liners, and 'Hitler's Yacht' the Aviso Grille. One of the K class light cruisers is in the same image with the Grille, as well as either the Scharnhorst or Gneisenau in the background! 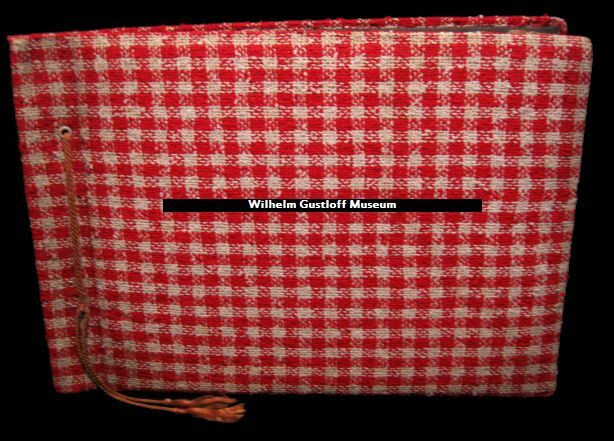 ​The following two are color slides of the Wilhelm Gustloff in Genoa, Italy in 1939. These were part of a larger collection of color slides in Genoa that featured other ships of the KdF fleet at anchor. The last three were taken during one of her voyages in Hamburg. The first view is taken of her bow looking out into the harbor, the second shows her passengers sitting on the Sun Deck, and the final image is of the Gustloff at anchor. 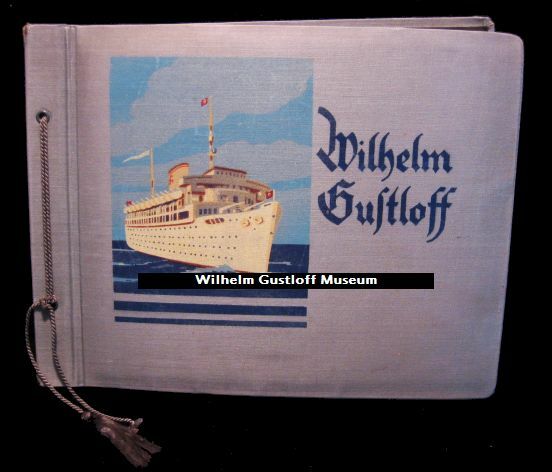 For some reason, out of all the Wilhelm Gustloff items I come across, none cause more of a frenzy than color slides. The number of people who collect color slides from World War II in general is ever increasing it seems. ​As I find the available time, I have also begun colorizing many photographs of her which can be seen throughout the museum website. Wilhelm Gustloff Individual Photos - Unknown 1939 Voyage.